Can we enjoy democracy, nation state and deep economic globalization at once? This is the big question posed by the outstanding development economist Dani Rodrik in his recent book “The Globalization Paradox”. His answer is: no, we cannot have them all at the same time. We are forced to choose two of the goals instead, limiting our pursuit for the third one. As Rodrik further argues, since democracy is and remains one of humanity’s greatest achievements and one can hardly imagine a global government, economic globalization is what has to be constrained. I would like to show here that from the point of view of sustainability, his is an essential insight. Why we cannot have democracy, nation state (in a broad sense, not in the narrow, nationalist’s one) and deep economic globalization (hyperglobalization, as Rodrik calls it) at the same time? If we want democracy and hyperglobalization, decisions must be made and enforced at the global level – otherwise we would have great problems with instability, since nation states pursue primarily their own interests. In other words, you don’t need the nation state in this case – all relevant decisions must be reached a global deliberation process. Nation state’s alternative here is a global democratic government – something hardly imaginable for practical reasons – people identify primarily with their nation, somewhat less with their region, and the third place only is given to the all-inclusive global level. And, how should global voting polls and other democratic procedures work at this level? Furthermore, this governance form would not really be desirable – global democracy presupposess some basic grade of homogeneity. But the so called global community is a cluster of highly diverse cultures, philosophies, historical backgrounds, institutional frameworks and so on. If we want both hyperglobalization and nation state, we have a problem, too. Free trade and (especially) free capital flows have costs (e.g., high costs of distribution due to outsourcing, an institutional “race to the bottom” in the pursuit of “comparative advantage”…) as long as the actors (national or regional communities) are differentiated. As indicated above: a democratic society would not bear such instability and costs. Having both hyperglobalization and nation state excludes democracy. Thus, we cannot have democracy, nation state and hyperglobalization simultaneously. 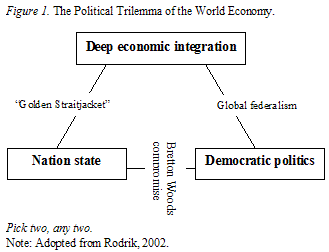 There is one more class of arguments for giving up deep economic integration in this trilemma: hyperglobalization (without a comprehensive – utopian – global governance structure at least) is in conflict with sustainability. Sustainability (in a narrower, mainly ecological sense) is an economic and societal challenge requiring state/government activity. As was shown repeatedly by distinguished economists (beginning with Marshall and Pigou, to, e.g., Baumol and Oates), environmental challenges mostly constitute social dilemmas – situations in which markets alone lead to misallocation (in plain words: to environmental havoc). These challenges can in most cases be prevented/solved effectively only through government activities (internalization of external costs through taxes, property rights definition etc.) – although, as shown in the pioneering work of Elinor Ostrom, they sometimes can be solved within the local communities involved. This doesn’t change the reasoning outlined below. Summing this point up: since we cannot have a global government, we need strong national institutions (or regional or local, for that matter) to cope with these challenges. Meanwhile, there is much evidence that deep economic globalization of the kind we are observing already now is rather eroding national standards of environmental protection and, more generally, efforts to promote sustainable development. Consider three examples: WTO’s rulings in disputes between the US and the EU about food safety; carbon emissions trading; and the “race to the bottom” in environmental standards in poor countries. The second example is about climate change. According to a recently published research results about one third of developed countries’ greenhouse gas emissions reductions since 1990 can be accounted to their increasing outsourcing of emissions intensive branches. A lion’s share of these “exported” emissions are now taking place in China, but other developing countries have their part as well. The problem with free trade in this context is: no matter whether the effect was intended or not, developed countries cannot but outsource. When they comply with their Kyoto-protocol commitments, the production of emissions intensive products becomes too expensive to compete in the world market. In countries without binding commitments these extra costs do not exist (e.g., China has no carbon tax or cap-and-trade scheme), so their products are more competitive – the global net effect is null. Developed countries are forced to outsource their emissions to developing countries. Under the current global trade regime they have no possibility to protect from these emissions intensive products. In other areas (such as content standards) the problems are similar: standards in other countries can hardly be controlled, but imports from there cannot be restricted. Third, the current trade regime puts poor countries under pressure to stick to low (environmental, labour) standards. If their governments decide to increase environmental or labour standards, production will move to other countries whose governments didn’t. And even if it doesn’t (e.g. in the case of purely domestic firms) – its exports are no more competitive, since higher standards increase costs. The governments could help/protect the affected industries (for instance by imposing tariffs), but they are not allowed to. Quite the contrary: under the current global trade regime governments in poor countries have the incentive to loosen regulations to make their exporting industries more competitive. As shown in the examples above, sustainability and the current deep economic integration are not compatible with each other. In accordance with Rodrik’s trilemma: we have to choose between more sustainable development and more free trade. Since they are further arguments against the latter (generally: the diversity in structures and preferences of communities, and thus different institutional arrangements throughout the world), we should take Rodrik’s argument seriously and rethink the structure of the global trade regime.